As CUSTOMER readers like you already know, the contact center and marketing have changed greatly in recent years, and the pace of change only continues to accelerate. That said, I wanted to highlight a recent solution that leverages automation and intelligence to make the contact center more responsive. I also would like to use this space to tell you about what TMC (News - Alert), the parent company of CUSTOMER magazine, is doing to help readers improve their strategies on the marketing front. The move to improve the contact center has been constant since the rise of PC-based software solutions like Telemagic in the eighties, the introduction of CTI (News - Alert) in the nineties, the expansion of IP communications in the last decade, and now with the advent of intelligent agents or bots. While automated agents are available in a number of forms, ERICA from Mobilize is designed to be something new, different, and more evolved. 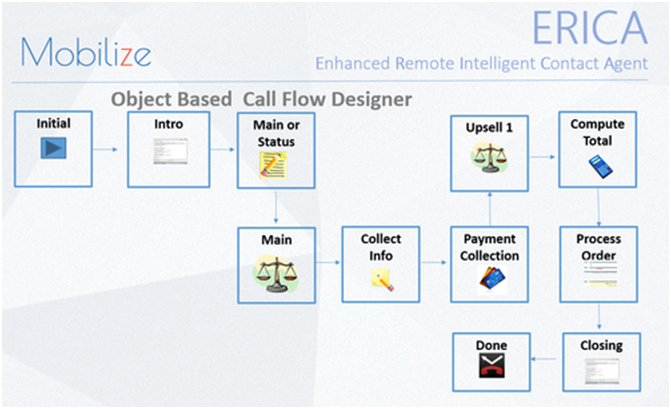 Consider it to be an object-oriented IVR solution allowing rapid customization of the IVR without direct programming. The Agent Maker software is supposed to be the solution to complex development needs. The system costs $895 a month for an agent that works 24/7 – perfect for infomercial response, handling up to 20 calls an hour with the ability to burst to 40. The training cost is around $1,500 and takes about 10 days. The company says completion rates are more than 90 percent; obviously the cost will be far lower than live agents. On a 24-hour clock, the service works out to about $1.24 per hour. The Order Capture module is able to upsell, can record calls, handle tax calculations, and handle voice talent recording. The Customer Service Module with CRM can handle real-time credit card processing, order cancellation, RMA, partial credit issuance, and more. The move to a bot-oriented world is not slowing down and Mobilize hopes its new solution will help companies lower costs while keeping customer satisfaction levels high. The service is especially suited for low-margin products such as infomercial-type wares, but as margin compression continues to affect every industry, the company seems to have a bright future indeed. Now let’s talk about TMC and what it’s doing relative to marketing automation. Many people know TMC as a company reporting on news. Many tech and communications companies leverage TMCnet and our various properties for marketing purposes, exhibiting at our conferences, lead generation, etc. Yet marketers would often come to us and ask, how they can improve their return on investment from these leads. In other words, they now have lists of people at companies interested in their product category, but they want to figure out how they can convert more of them into sales. About six years ago we responded to this problem by introducing a CMO Dinner at ITEXPO in Austin, Texas. We invited Marketo (News - Alert) as a keynote speaker – before it was as well known as the company is today. Last year at ITEXPO in Florida we teamed up with Jeff Dworkin to wow our CMO dinner audience with all they needed to know about lead management and follow-up through automation. It was a great dinner; we had a ton of positive comments. Many people asked us if we could kick it up a notch and help their companies with marketing automation. We thought about the idea, and it made sense. So we launched Marketing Automation Partners as an outsourced marketing automation service. Half our job is to help companies that understand how important marketing automation can be for their company, and the other half is evangelizing the benefits of MA. To help spread the word, we recently did a webinar titled Don’t Let Them Tell You Marketing Automation is Easy. The webinar, which is now available on demand, goes beyond discussions about how to measure marketing spend via vanity metrics like clicks and likes, and helps listeners understand how marketing impacts revenue.